Too much sweating on head can be nothing but can also be serious. Figure out its causes and make a properly designed plan with your doctor to get over it. Excessive sweating on the head and face can be embarrassing and uncomfortable. Approximately 2-3 percent of the population suffers from hyperhidrosis, or having too much head sweating. This condition can easily be managed with medical attention, though many are too embarrassed to ask for assistance. Determining the cause of your sweating can help you work with a doctor to eliminate your symptoms. It can be a natural reaction of the body. When you exercise or become warm, the body will release sweat to cool the skin. The body may also release sweat when you become embarrassed, afraid, angry or nervous due to the muscles tensing. However, in some cases, sweating may become excessive. The mechanism that triggers sweating will not stop the way it should, leading to emotional or physical discomfort. This can occur in the hands, armpits or feet as well on the head. Primary hyperhidrosis is a medical condition that causes excessive sweating, but it not triggered by another disease or symptom. Primary hyperhidrosis is localized to a certain part of the body, such as the head, though these symptoms will appear symmetrically when the patient experiences sweat on the limbs. Doctors believe that primary hyperhidrosis is caused by a malfunction in the nervous system that may be genetic. This condition is not dangerous, but it can cause an inconvenience or social discomfort for the patient. Secondary cranial hyperhidrosis is a side effect of another medical condition. It can also be a side effect of medication you may be taking. Medication used to treat psychiatric conditions; dry mouth and blood pressure often list hyperhidrosis as a potential side effect. Certain antibiotics or supplements may also cause hyperhidrosis to occur. Abusing substances or medications can increase the risk of head sweating. A change in hormone levels can lead to secondary hyperhidrosis. 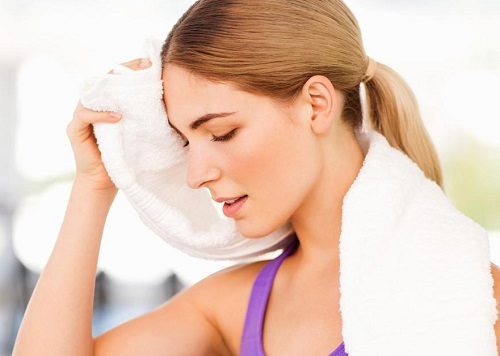 Many people experience more frequent sweating on the head or face during pregnancy or menopause. Hyperthyroidism can also cause the patient to experience excessive sweating on the face or throughout the body. Heart conditions can also lead to excessive sweating, caused by the strain on the body. Those who suddenly begin to experience sweating on the head may be at risk from suffering a stroke or heart disease. 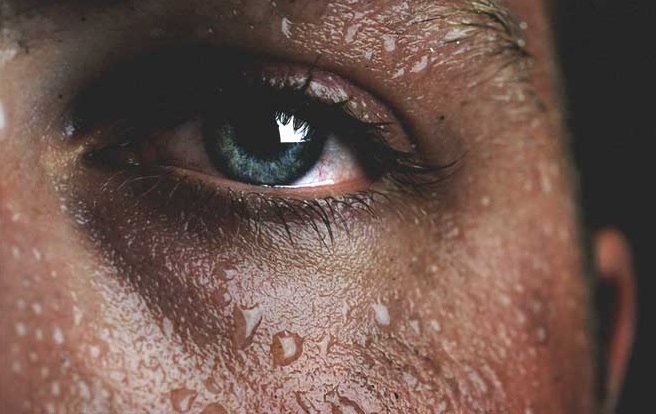 This sweating may be accompanied by dizziness, chest pain or difficulty performing strenuous physical activities. Conditions which damage the nervous system can limit your body's ability to properly regulate the sweat glands. Those in the early stages of Parkinson's disease will frequently begin to experience head sweating. Acromegaly, some cancers, pheochromocytoma, tuberculosis or severe infections can also show unwanted sweating when they previously did not suffer from this issue. Spinal cord injuries that damage the nerves can lead to similar symptoms. 1. Note and test. When unexpected sweating begins, your doctor will perform tests to help you determine the root cause. Make note of any triggers that appear to bring on your sweating such as a stressful event or eating certain foods. Also make note of whether or not your sweating is more common at a specific point of the day or if it tends to come on suddenly, and if it only appears on the head or other parts of your body. A paper test can be done to determine how excessive the sweating is. A starch-iodine test may also be performed to determine the level of your sweating. 2. Herbs. Once it is determined that you are suffering from chronic sweating you can begin to work on finding a treatment option. Consuming asparagus, witch hazel, sage, Osha, Schizonepeta or Rehmannia can help calm the sweat glands so you will not sweat as profusely. These are available in supplement form, or you can add these items to your diet. 3. Vitamin intake. Increasing your vitamin intake can also help reduce sweating. Taking a supplement or eating foods that contain a high level of B vitamins can help you manage your sweating more effectively. These include fruits, vegetables, whole grains and lean proteins such as eggs or fish. 4. Foods to avoid. Some foods can lead to a higher level of sweating. Those who are attempting to naturally manage their condition should cut these foods from their diet to avoid sweating. These include foods with a high spice level or foods with a great deal of garlic. You may also be able to balance out these effects by increasing your juice intake when you consume them. 5. See a doctor. If you are suffering from excessive head sweating that is a side effect of another condition, you will need to manage your other symptoms in order to get your head sweating to stop. Your doctor may alter your current medication to help relieve your side effects. Your doctor may also recommend exercises or physical therapy to help manage a heart or physical condition that could be putting an excessive amount of strain on your body. Therapy may also be necessary if your sweating appears to be caused by mental stress. What Causes Pain in the Back of Your Head? Why Does Your Face Become Flushed? Why Are Your Sweat Glands Under Armpit Blocked? What Causes the White Spots on Your Face?